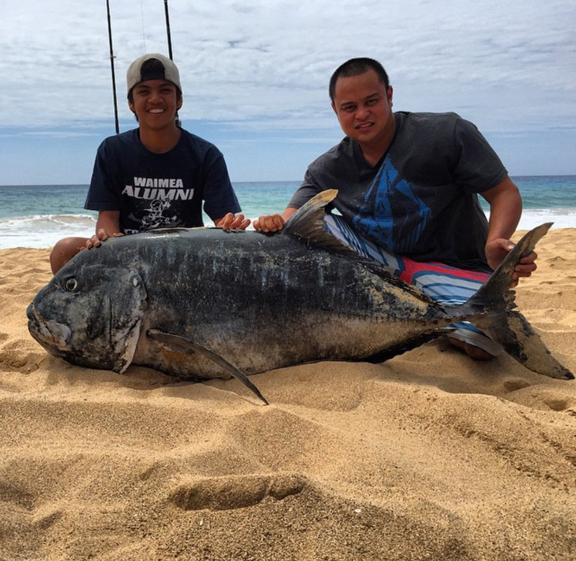 Avery Miguel, age 14, started a hot streak of ulua fishing by catching a 93-lb ulua and capped it off a week later by landing a 130.6-lb behemoth. Avery and his Uncle Roland Rull were crashed at 2 a.m. when the strike came, but Layne Fernandez witnessed the strike and shook the guys awake. Avery defeated both fish using a his 13-foot green Wasabi ulua pole, Shimano Torium reel and 60-lb test Trilene Big Game line.